Being one of the most Vietnamese proud destinations, Halong Bay never let the world stop being admirable on its beauty. In Halong Bay, the charms not only come from the wonderful numerous picturesque of limestone and tropical vegetation. But also to the separated unique traditional lifestyle. This formation exist over millions years, create an amazing and lively populations in vast East Sea. 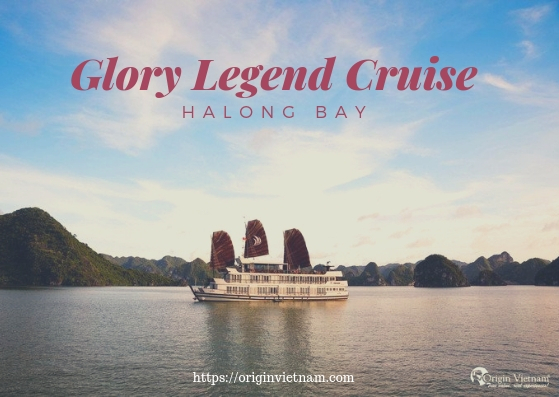 Famous by being one of the most recommended Halong bay tour choices, Glory legend cruise is the first 4-star service boats make a separated journey to get complete experience for customer. Unique with various shapes, Glory Legends always attentive in upgrade and perfect luxury line for supplying fresh experiences on Halong Bay in the worthy modern cruise. Your trip will more special with become a pioneer to discover Halong Bay - Lan Ha Bay in selectively distinguished routes. Being the first cruise company that organized a brand new specific cruise through Ha Long Bay - Lan Ha Bay. Glory Legend Cruise assures an unbeatable service in all 4-stars boat in this area. With the various in standard of rooms from Deluxe, Family, Suite... 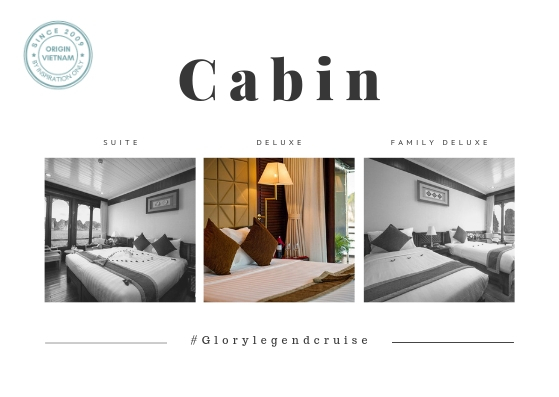 Glory Legend Cruise be sure to suite with any your conditions. Overall of cabins make point with the clean and warm wooden floor in the oriental rustic design. This nostalgic arrangement create the unique gentle and delicacy space, bring the absolutely relaxing for customer. All room are decorated by a chic large glass window wall arrays, not only sunny-welcome purpose. It also is ideal design to help tourists get closer Halong Bay majestic scenes. For sure, is the modern amenities system along with highest quality room service will make your journey in perfect, exceed your expectation. Not only the cabin, the public room zone also will be another charm satisfying your eyes. Space of breeze restaurant and bar is bold by luxury lights system and elite arrangement of furnishings. In here, with the menu inspired from locally style and most popularly international cuisines will take you revel on the journey of high peak of taste. The best choice to enjoy the attraction of Halong Bay is spending time on sinking in the sunny-flooded sundeck with the spectacular views opening in front. Your world will turn into quiet and time will fly quickly away while you admiring magic happening around. And if you love be treatment in massage therapies goes relaxation and reduces stress. Glory Legend Cruise supply you the high standard spa services with skillfully customized massages, selectively facials therapies suitable to everyone. Companioning with warm attitude and professional skills of staff teams. Your journey is assured in under perfect controls, both the safety and experiences. 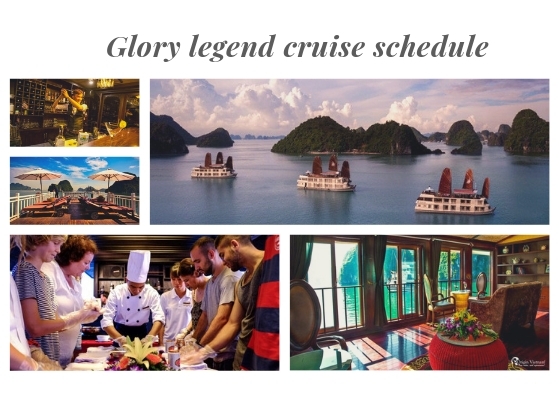 Glory legend cruise – Should be in love with which charms of Halong Bay? In Halong Bay, you not only been overwhelmed with the mighty of nature, you also be admirable in the rustic and honest lifestyle in here. The life of people born and grow from ocean, with them, ocean is the second mothers. In Glory legend cruise schedule, you will be explored the largest and most beautiful caves and islands, islets of Halong Bay. The time goes into Sung sot Cave. Where you will observe in directly with the most amazing creation of Halong water and wind: Stalactites system. Then, let go straight to Bai Tu Long – the beautiful area of emerald water and nature scenes, take your relaxing time on white sand Ti Top beach with the pure water as the gems of Earth to washing your tiring and troubles. Take the time to floating on bamboo boat along Cua Van fishing village. You will be welcomed by the most warm honest from residents, they will telling you their stories about their history, their love and way they live harmony as close friends with nature in this land. Coming back to boat, let joining cuisine exploring time with the cooking class with the chef captain. This is the exciting time to you get how to make the most famous Vietnam dishes, understand how these food can seduce you or even the fastidious chefs in over the world. "Glory Legend offered complete 5 stars luxury. The experience from start to finish was perfect" is what the old customer said about Glory Legend Cruise. With all the meticulous attentions on services quality and space arrangements. This cruise proved that they can do over than they had. You are falling in love with this Cruise or any other Halong bay cruise overnight. Do not hesitate and connect with Origin Vietnam at Hotline: 848 2909 8686. With the great team on both of attitude and knowledge, we will give you the most perfected choice.